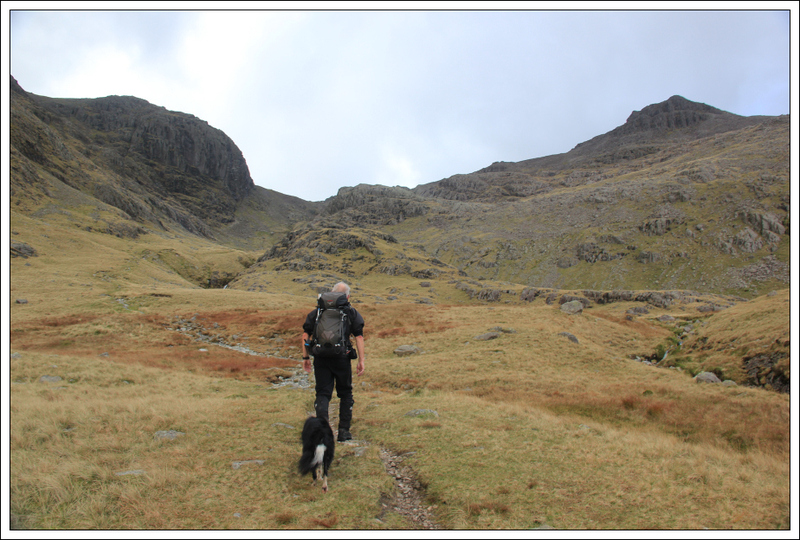 Following an excellent walk up St. Sunday Crag and Fairfield on Sunday, I met back up with Dave again today for an ascent of Scafell and Slight Side. 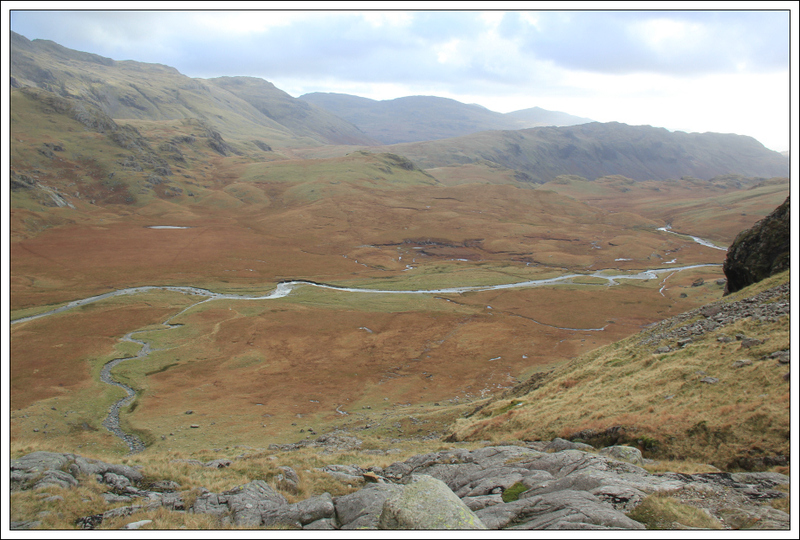 To get to the starting point today I drove from Ambleside to Brotherikeld via Wrynose Pass and Hardknott Pass. 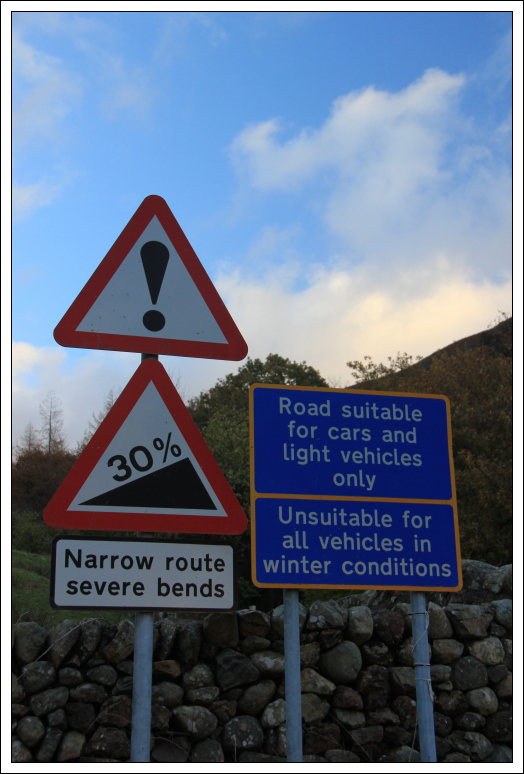 This road is one of the steepest roads in the UK. 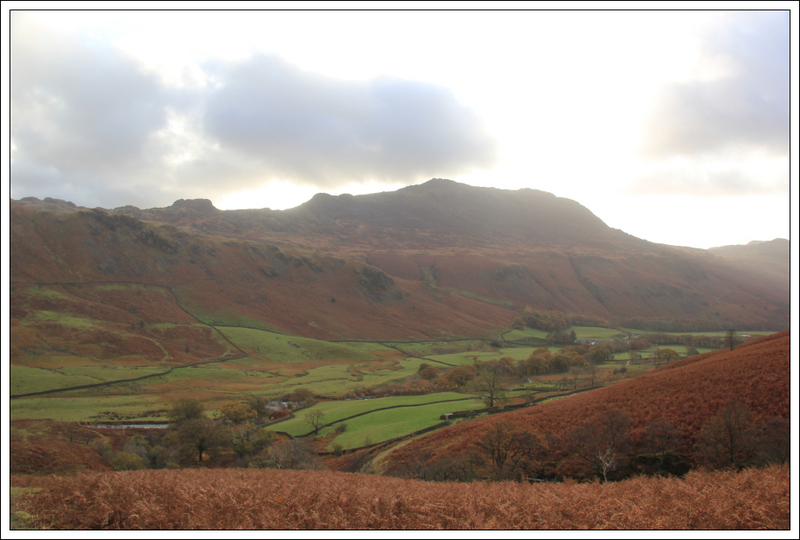 As well as being steep, it is narrow, has numerous hairpin bends, lots of potholes and sheep on the road. If you want to test your driving skills, tryout this road. Hill Descent Control came in handy . 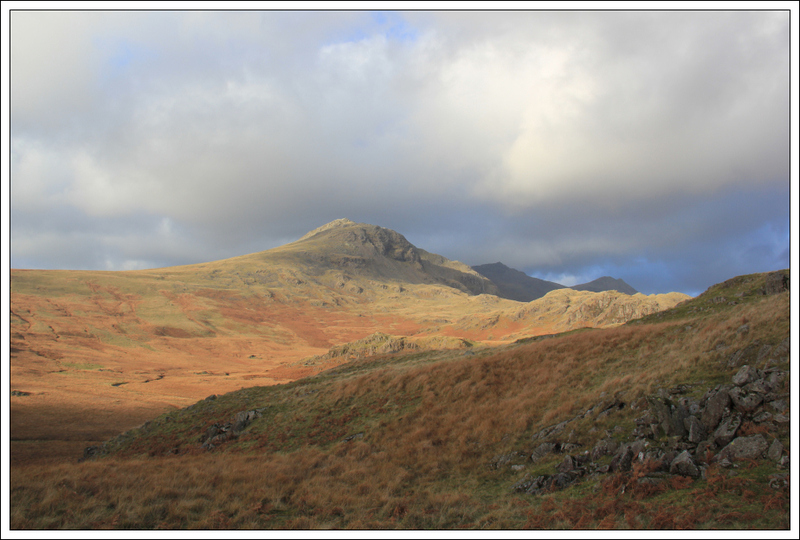 On arriving at Brotherikeld it was a pleasant surprise to find that the parking there was free of charge. 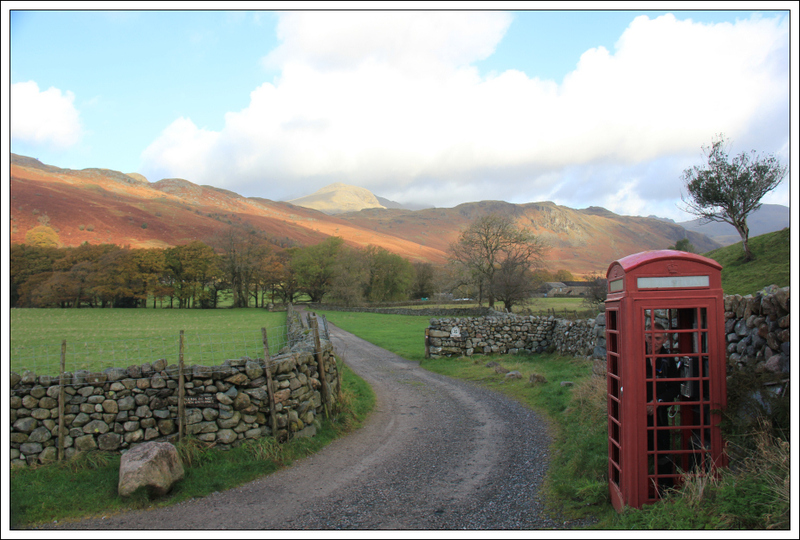 From the car park, we walked a short distance down the road before turning onto the track beside a red phone box. 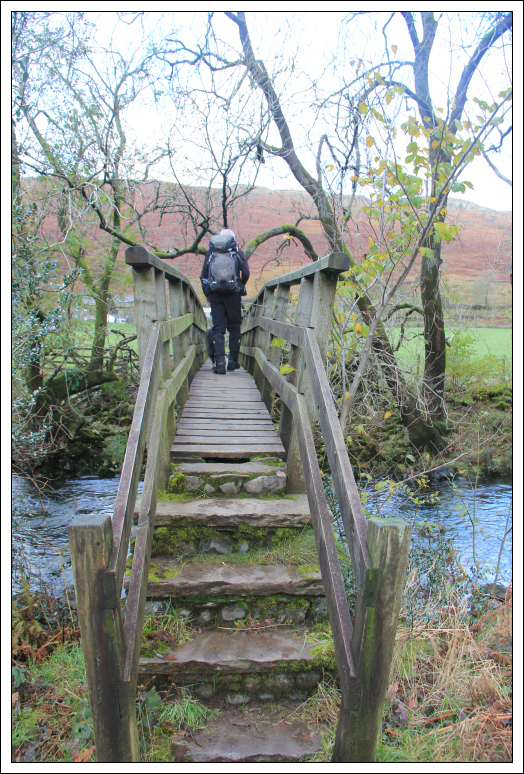 After walking a few hundred metres we crossed over the River Esk and made our way towards Taw House. 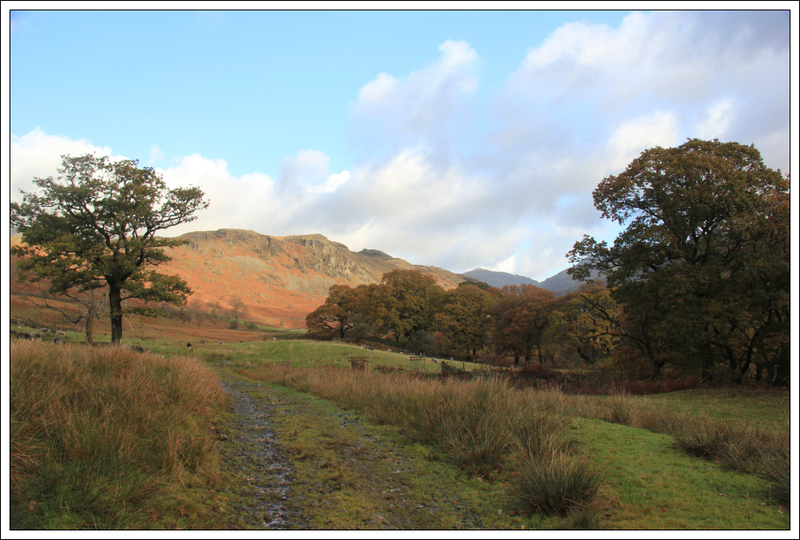 Once beyond Taw House, the walking was pleasant. 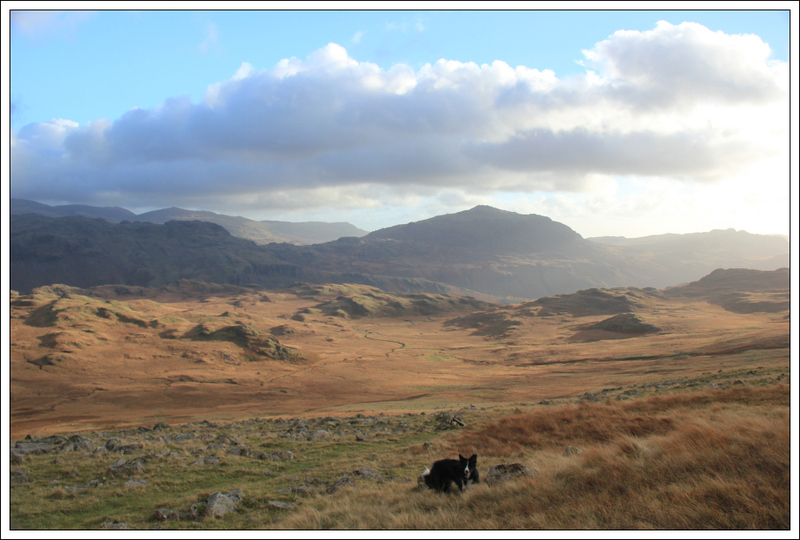 We passed numerous sheep as we walked along the track. 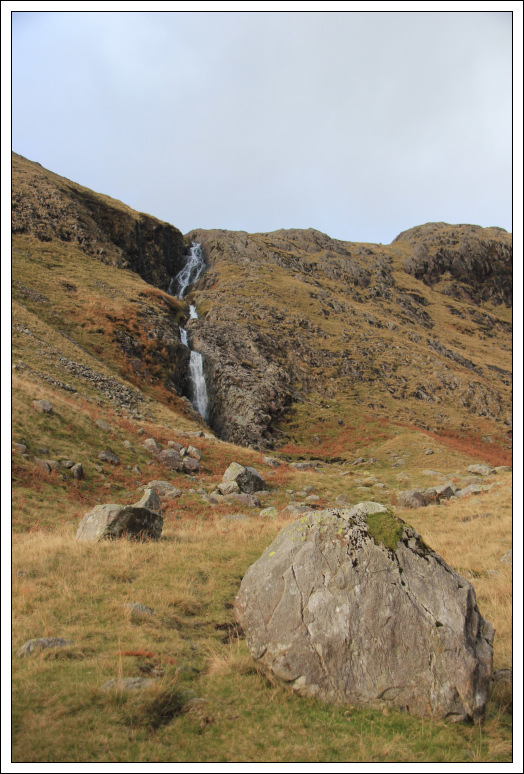 After climbing over a stile we soon arrived at a nice waterfall. Beyond the waterfall we left the main track, which runs alongside the River Esk, to take the upper path which runs between High Scarth Crag and Silverybield Crag. 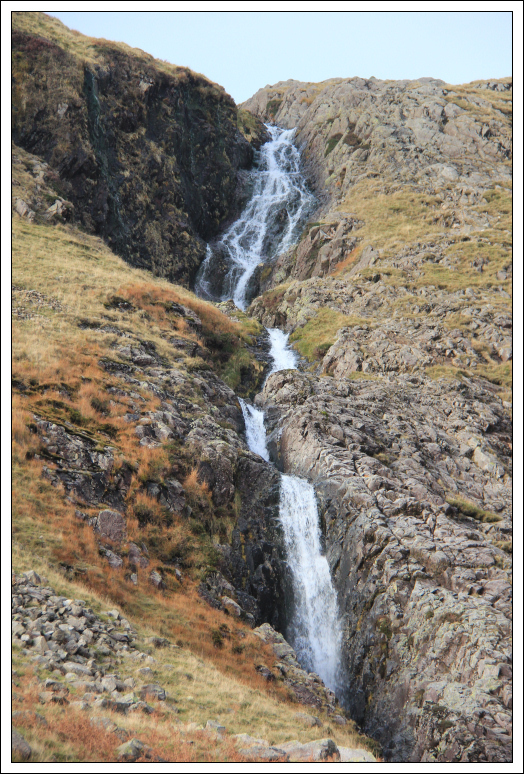 It was excellent walking with Dave who is very knowledgeable of the Lakeland fells. 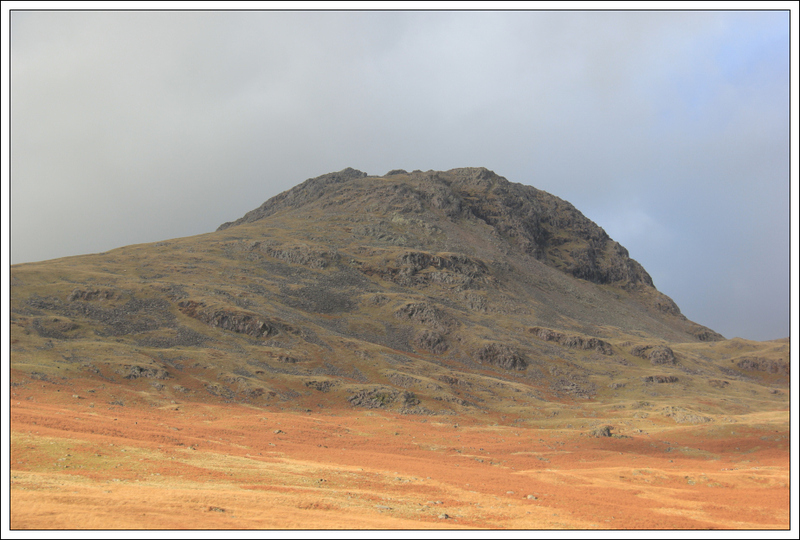 During the walk, Dave pointed out the various hills and crags including Bowfell, Crinkle Crags, etc. 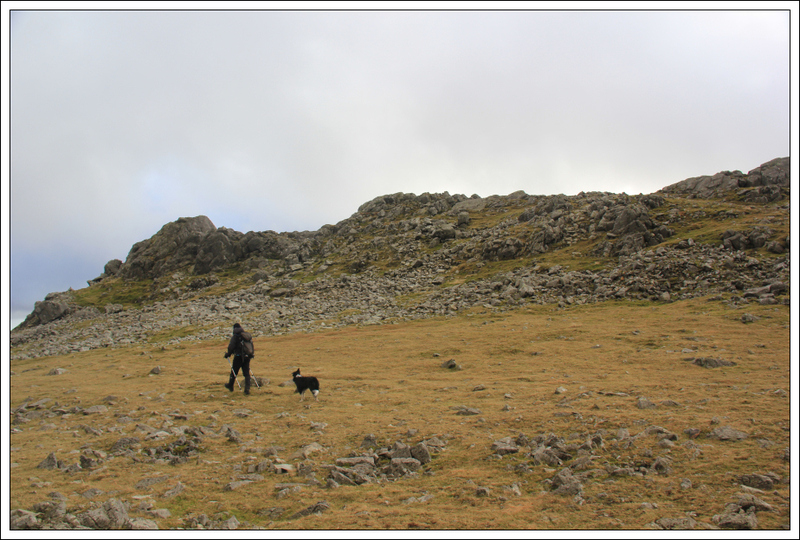 A short distance before reaching Cam Spout we passed a number of massive boulders. 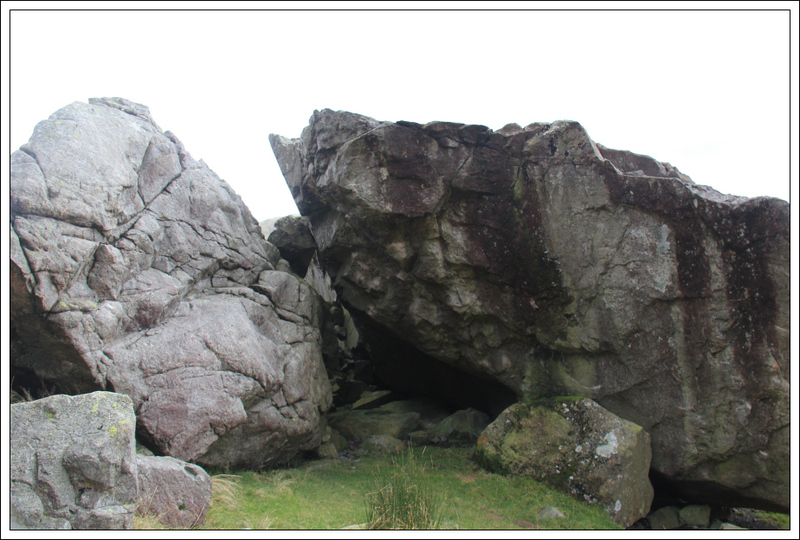 These boulders are apparently known as Sampson’s Stones. 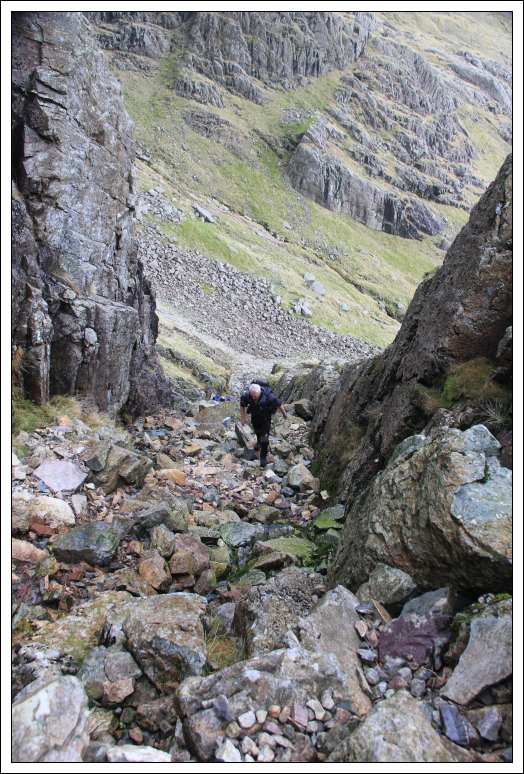 On reaching the base of Cam Spout we met an Australian tourist who was intent on ascending Scafell Pike. 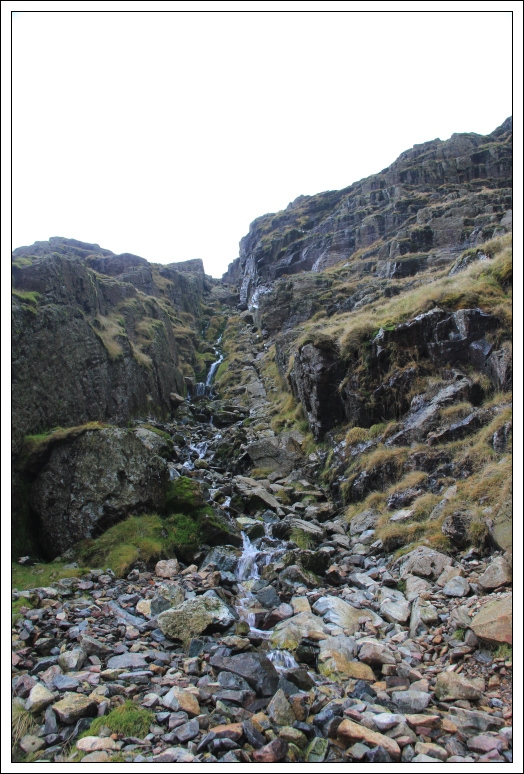 From the base of Cam Spout, instead of taking the path, we scrambled up the rocks directly next to the waterfall. 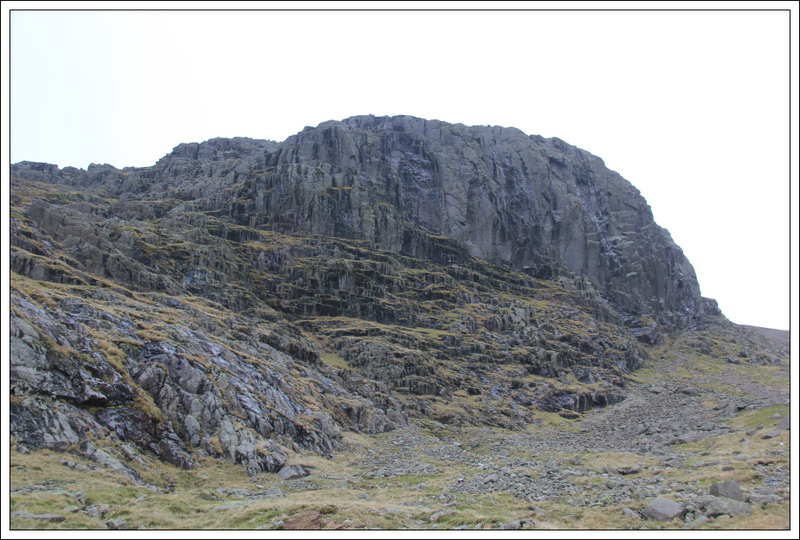 This was a nice easy scramble with lots of holds on good rock. 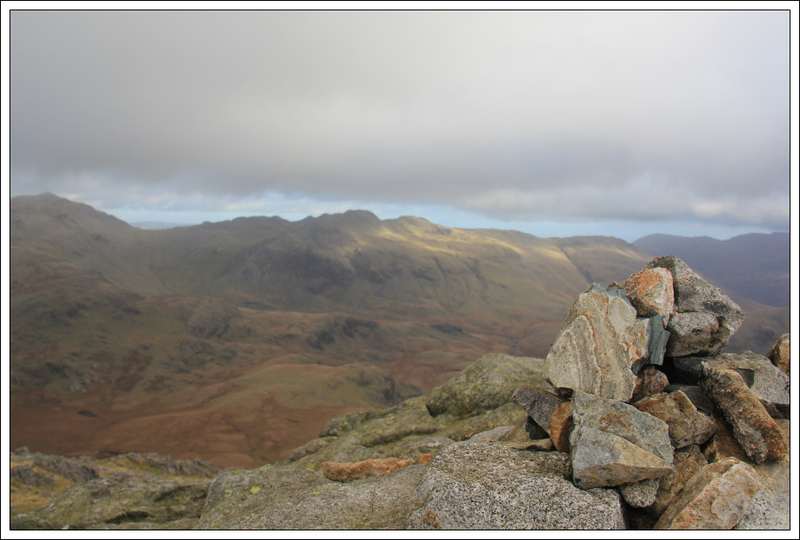 On reaching the top of Cam Spout it was nice to stop for a wee rest before progressing on towards Mickledore, the col between Scafell and Scafell Pike. 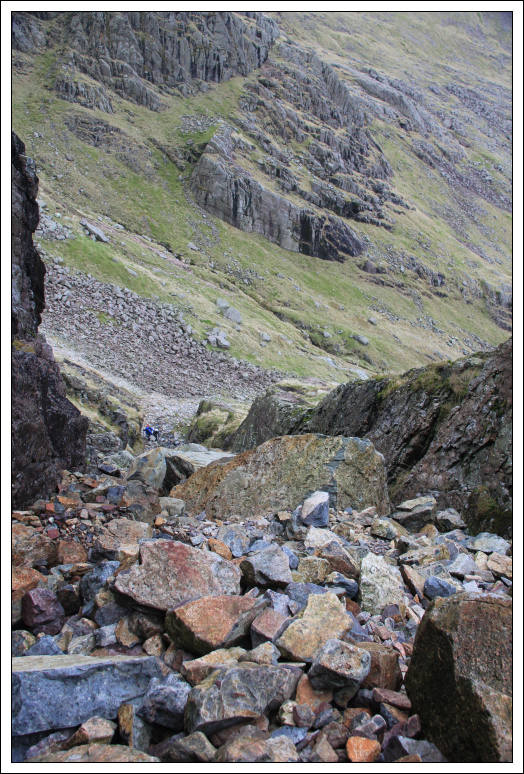 Circa 100m below Mickledore we made our way across to the base of the rake leading up to Foxes Tarn. 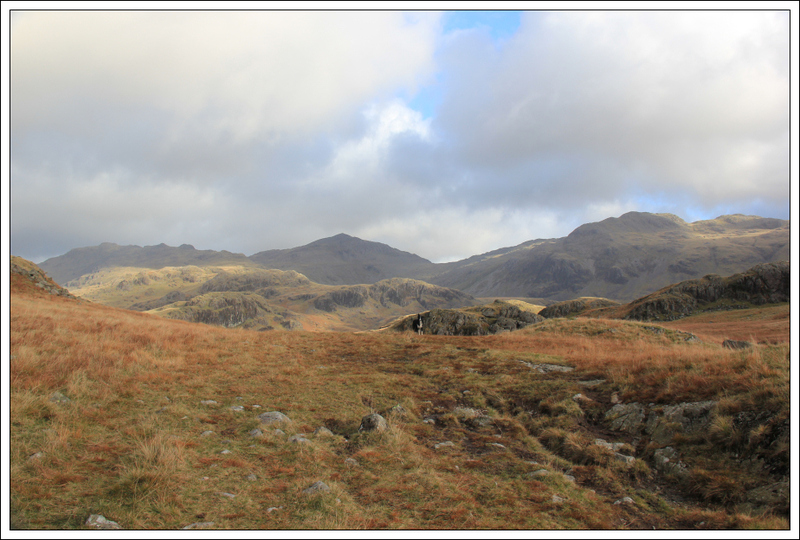 The ascent up the rake, known as Foxes Tarn, was straight-forward albeit a bit wet in places. 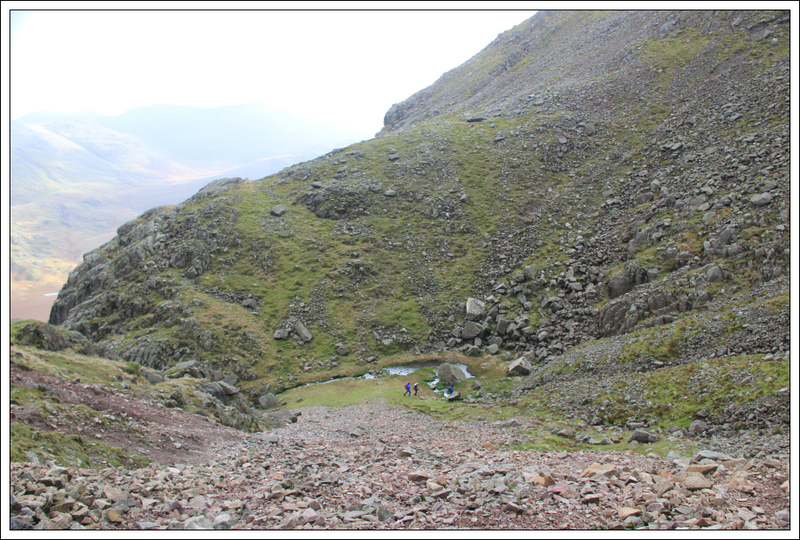 In the next photo, the people at the base of the rake give an idea of scale. I would guess the ascent to be around 50m. 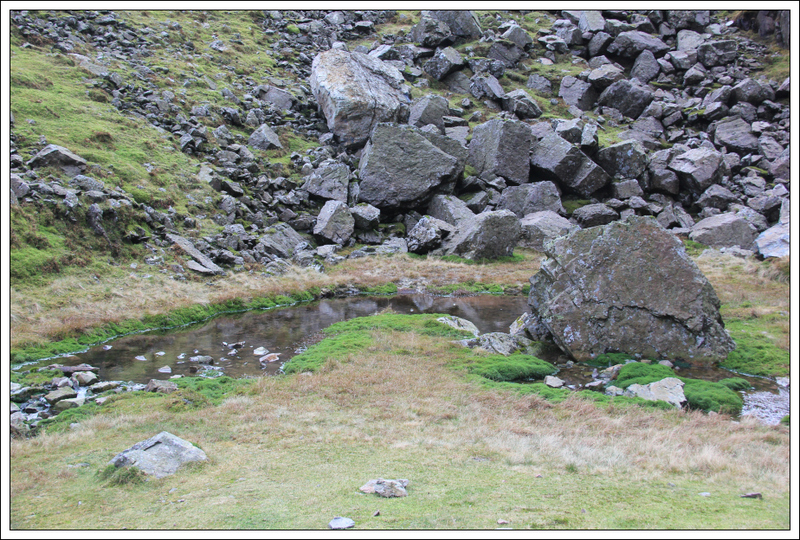 As expected, from previous research, Foxes Tarn is not much more than a puddle. 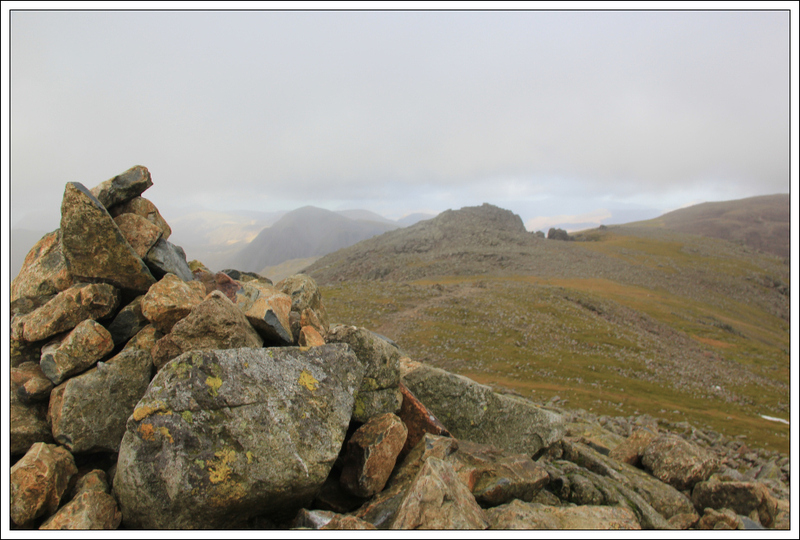 After having a swift bite to eat at the tarn, we made our way up a steep eroded path towards the summit of Scafell. 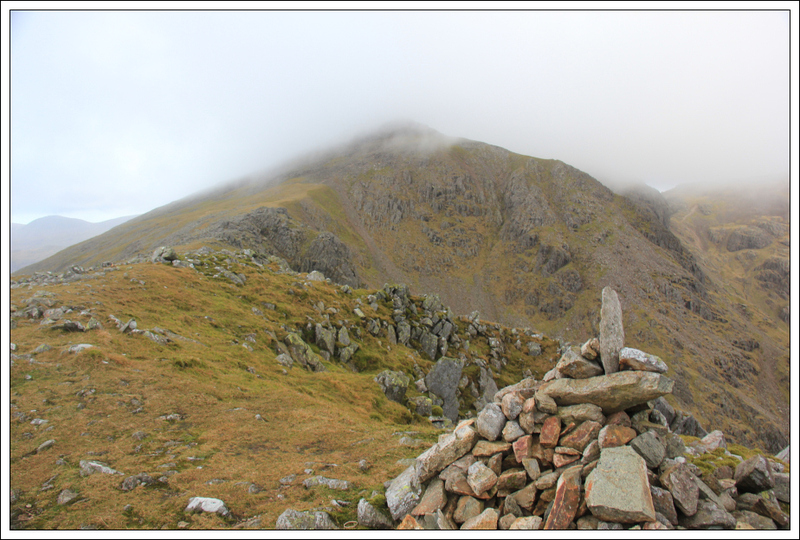 It was a touch disappointing to reach the summit whilst it was covered in cloud. 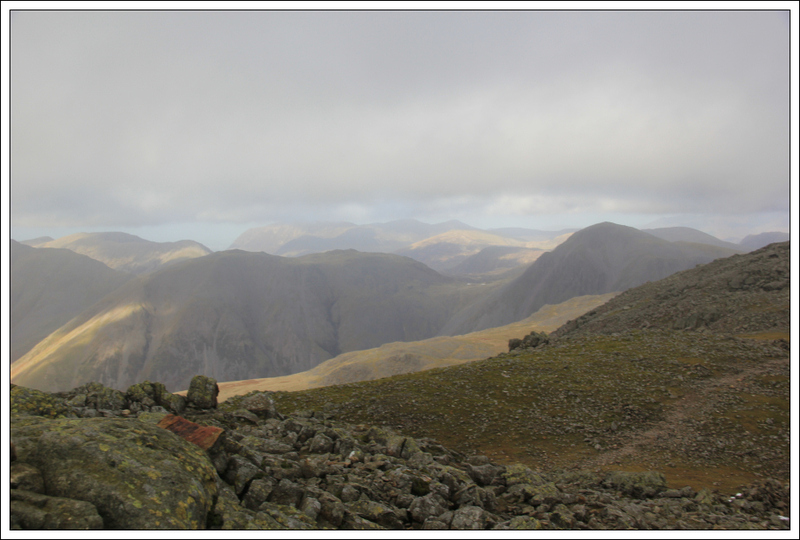 However at the same time it was great to reach the summit of England’s second highest mountain – an arguably finer mountain than its higher neighbour Scafell Pike. 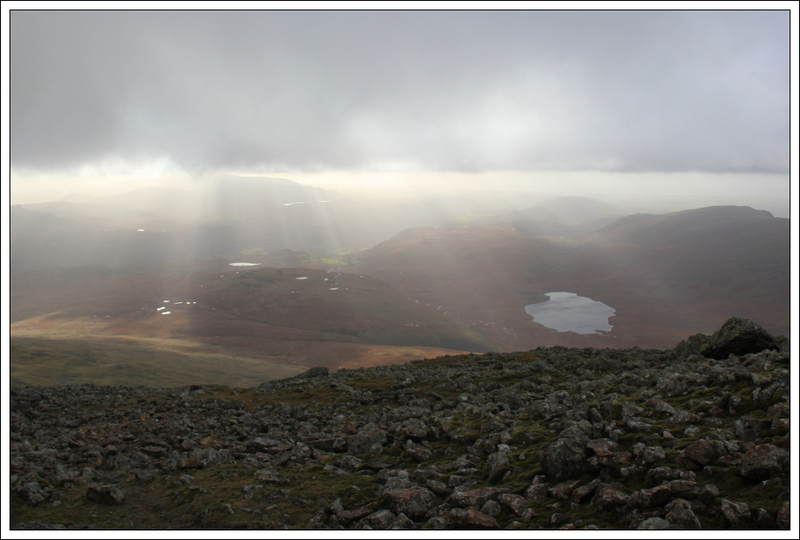 From the summit of Scafell, we made our way down towards an unnamed 850m top. 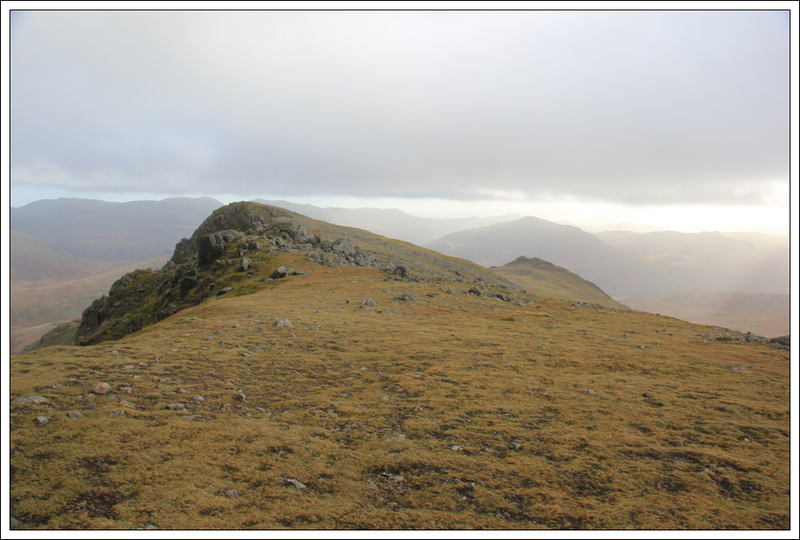 From the 850m top we continued onto Slight Side. 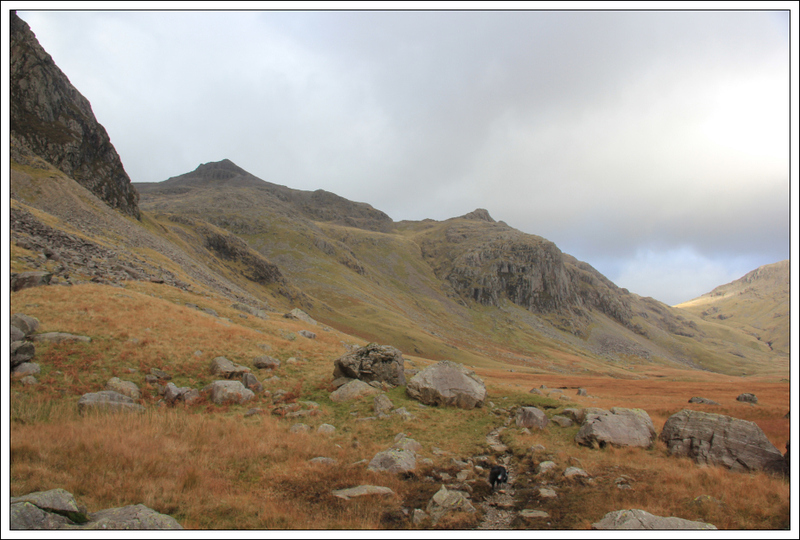 The descent from Slight Side was fairly pleasant compared with the steep ascent of Scafell, especially once off the hard track and onto grass. During the walk out, we opted to leave the main path leading back towards Wha House and instead went cross-country for a short distance to get back onto our in-bound track. 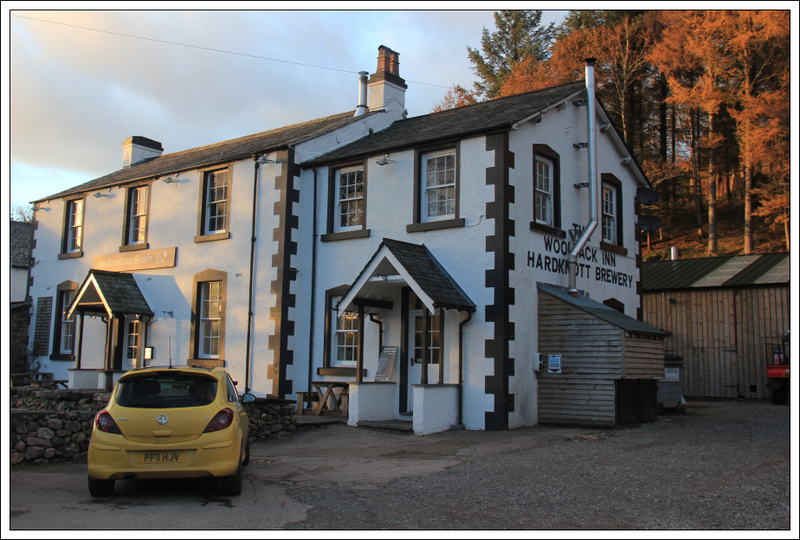 On returning to our cars we drove a short distance down the road to the Woolpack Inn for a nice pint of real ale. This is a really nice pub. Another excellent day out on the hill. Thanks again Dave .